In history, the Dutch will be remembered for their passion for tulips. After 400-plus years, theirs is an enduring love affair. First introduced to Holland in 1593, the tulip has become a symbol for the country. Ask anyone, anywhere to name things that are "definitely Dutch" and the answer is going to include tulips, windmills and wooden shoes, usually in that order. Since the 1600s, tulip growing has been a major crop for this flat low country situated just off the North Sea in Northern Europe, bounded by Denmark, Germany, France and Spain. Today nearly half of Holland's 47,150 acres of flower bulb farms are planted with tulip bulbs (23,412 acres). Other bulbs ranking highest in acreage (but far below the tulip) are lilies, gladioli, narcissi and hyacinth (in that order). Every year about three billion tulip bulbs are produced in Holland Of these, approximately two billion are exported and one billion remain in the Netherlands. The vast majority of them are used for "forcing" of cut flowers and potted plants. The United States is the top importer of tulip bulbs, followed closely by Japan and Germany. Nearly one billion bulbs go to the USA -- most to home gardeners -- and once again, tulips take up the greatest share. It is a widely-spread misconception that tulips and other bulb flowers are native to Holland, growing wild in remote areas still. Nothing could be further from the truth. Almost no bulbous plants are native to this part of the world. For the origins of the tulip, we look to central Asia. This is site of their prime genetic center in the Tien-Shan and the Pamir Alai Mountain Ranges near modern day Islamabad, close to the border of Russia and China. From these areas, tulips spread to other regions including China and Mongolia to the east and to other regions to the west and northwest. A secondary genetic center developed in Azerbaijan and Armenia (Transcaucasia). From this area, tulips spread to locations which included far-flung parts of Europe. They are still encountered today growing wild in regions of the Balkans, Spain, Portugal, Italy, Switzerland and France. In nature there are probably no more than one hundred and fifty tulip species native to Europe. But that number depends largely on how one defines "wild species". 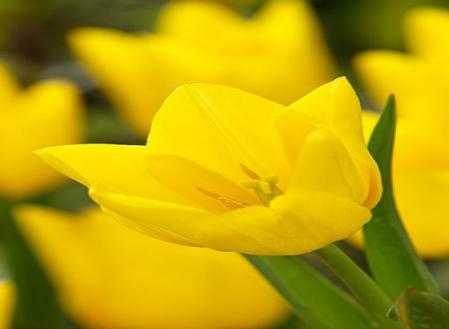 One of these tulips, Tulipa celsiana, is found wild in southern France in the region around Toulon and Cannes. This miniature tulip grows there between the rocks, under extremely dry conditions. It is visible only for a short growth and flowering period in the early spring. Flowering is quickly followed by withering, and the plant then survives as small bulbs that not only serve to help it survive the winter but the summer as well. In any event, the advance of the tulip in nature never got so far that it reached the Netherlands, not even within 500 miles. The tulip's natural habitat is made up of mountainous regions. They are found growing there at very high elevations in the mountains, which means that they are often covered with a thick layer of snow during the winter period. This offers them good protection from the severe cold. In quite a few of these species the inner side of the skin that covers the bulb is covered with a thick hairy layer that provides extra protection. Not surprisingly these types are often called "wooly tulips." Given this natural proclivity for high places, it is all the more remarkable that the Dutch should become known for growing tulips when their country is largely situated below sea-level and "enjoys" winters that are more wet than they are cold. Since these are not conditions that make tulips happy, the Dutch have invented systems that provide winter soil drainage. All through the sandy coastal bulb growing regions one sees farm fields ringed by drainage ditches that draw surplus water quickly from the fields. From the ditches the water flowers to canals that flow to the sea. With a country below sea-level, it is not unusual to see water canals flowing through embankments that tower above the surrounding fields. Today most people (even in the Netherlands) still say that tulips originally came from Turkey and that is where their natural habitat is. But this is only partly true. A significant percentage of the tulips cultivated in the Netherlands originated from areas now considered part of Russia, around the Black Sea, in the Crimea, and from the steppes located north of the Caucasus. However in the 1500s when the tulips were first introduced into Europe, these areas belonged to what was called the great Ottoman Empire, also known as the Turkish Empire or Persia. It is known that the Turks were cultivating tulips as early as 1,000 AD. Before tulips ever reached Europe, they had enjoyed a long and rich cultural history in Persia. The most obvious explanation for how the tulip got its name was its resemblance to the headgear worn by many people in the Middle East, such as the Persians -- the turban, that was also written as "toliban". Changed into Latin, this became "tulipa". 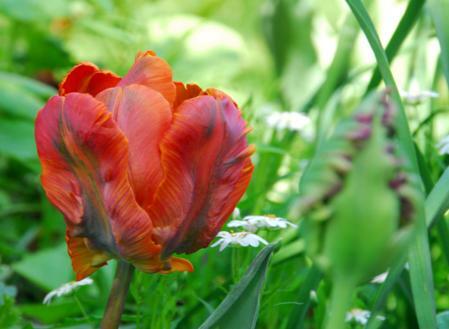 With a little imagination, the flowers of some tulips do look like a turban. The actual origin of the word is unknown. These days there are various categories of Tulips. This group was developed in the Netherlands: Mr. D.W. Lefeber, the prominent Dutch breeder, was the one who watched over the early beginnings of this type. 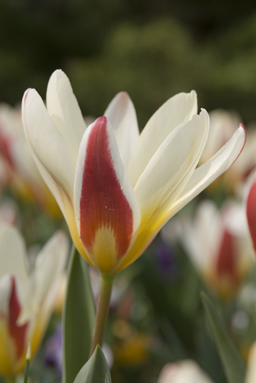 He crossed the famous Tulipa fosteriana 'Madame Lefeber' (also known as 'Red Emperor') with various cultivars from the group of tulips then known as the Darwin tulips. 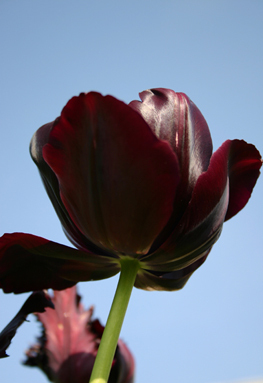 The result of this cross-breeding was a series of tulips that excelled due to their flower size and sturdy, long stems. When the buds are still immature, they look almost like little pyramids. Due to these qualities, these tulips have really made a name for themselves as cut flowers, and are cultivated extensively for this purpose. In gardens, too, they are very useful. A location somewhat out of the wind is preferable for these tulips, due to their height. At first, the only colours available were orange and red, but now there are yellow and pink varieties as well as varieties with differently coloured speckles and stripes on their petals. 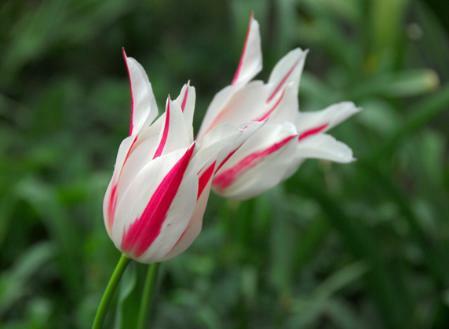 These are beloved tulips that have double flowers; short, sturdy stems; and an early flowering period. They can be used in many ways, but are especially favoured for beds and containers where they produce brilliant colour effects. On a sunny day when the flowers are entirely open, they measure about 7.5-10 cm across. The variety of colours available in this group is not as great as it is for other groups, however, its double flowering more than compensates for this. If these tulips are grown in combination, it would be best to use the 'Murillo sports'. Although these vary in colour, they are almost identical when it comes to height, flowering periods and flower size. 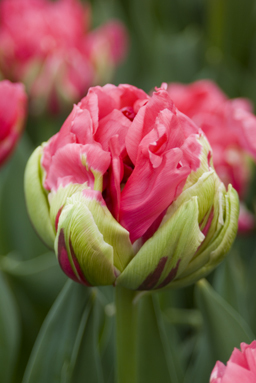 Because of their shape, these tulips are also known as peony-flowered tulips. The flowers, which are always large and double, can easily reach a span of 10 cm across. Since the flowers can be damaged in extreme weather conditions (rain and wind), it is advisable to plant them in a sheltered location. 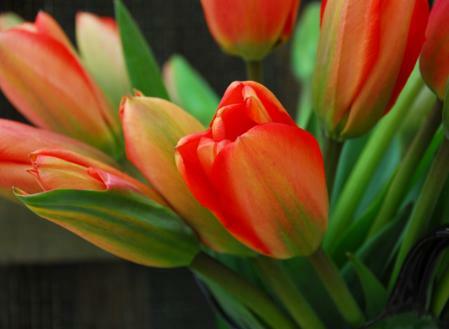 Double late tulips perform exceptionally well in regions having cold winters and late springs. Certain cultivars are suitable for forcing indoors. More and more people are becoming interested in fringed tulips - so much so, that these tulips now have their own group. It must be remembered, however, that because the tulips in this group are mutants from various other groups, that heights and flowering periods will vary somewhat among them. The one characteristic they have in common, though, is their finely incised petals. Just like so many other tulips, T. greigii also comes from Turkistan. Since its introduction in 1872, great numbers of cultivated forms have been developed. This process is still under way and will no doubt continue long into the future. This group is currently the largest group of tulips closely related to (derived from) botanical species. The principle colours are red, yellow and white. Combined with their stunning spotted and striped leaves, these flower colours create an unforgettable visual impact. The flowers, large in proportion to the plant's total height, open wide in the full sun. 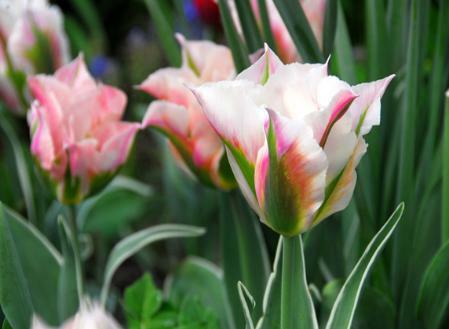 These qualities make Greigii tulips unsurpassed for use in borders, rock gardens, and in pots. 'Red Riding Hood' is the most commonly cultivated and therefore the easiest to find in garden centres, etc. The fact that this little tulip naturalises so easily is certainly another big advantage. These little tulips growing in the wild in Turkistan were given the name T. kaufmanniana. They were introduced to Europe in 1877 by the Dutch firm of Van Tubergen. The flower petals are creamy-white inside, running over to pink-red on the outside with a very obvious yellow basal spot. Specimens of this original species are still being cultivated but only in very small quantities. The distinguishing features of this species are a short stem and an often speckled or striped foliage. Gorgeous cultivars have been developed from this species over the years. This breeding has resulted in larger flowers, noted for their brightly contrasting colours. During the sunny hours of the day, the flowers are wide open and provide an entirely different colour effect than when closed. The flower shape changes dramatically also; when open, they resemble a shining star. These early-flowering little tulips are especially beautiful in rock gardens and containers. They naturalise easily. What makes these tulips different are their slender flowers with often pointed, recurving petals. The flower stems are thin and not very sturdy, making them susceptible to wind damage. A few also make good cut flowers. This group does not contain as many cultivars as most other groups. These whimsically-shaped, unusually-coloured tulips have been developed from mutations of certain Late-flowering tulips, and from tulips in the Triumph group. The petals of these tulips are serrated or "fringed". As the large flowers are exposed to the sun over time, they open so widely that they almost flatten out. The flowers are green as buds, and as they grow it may seem as if the tulips will remain entirely green forever. But as the flower matures and opens, the brilliant colours are revealed. This is when their black, star-shaped centre and their bright yellow stamens become apparent. Some varieties are known as 'bicoloured', but are actually 'tricoloured' because of their ever-present green colour. Although the stems of Parrot tulips are fairly strong, the great size of their flowers prompts one to plant them in sheltered spots in the garden. The flowers are somewhat sensitive to the effects of long-lasting cold, wet weather. Long ago, in the 17th and 18th centuries, tulips with petals displaying flamed patterns (also known as 'broken tulips') demanded extremely high prices. Now we know that this colour-breaking is the result of certain virus diseases, but in those days, of course, the concept of viruses was as yet completely unknown. Some of these classic Rembrandt tulips can still be seen in the famous bulb garden, the Hortus Bulborum in the Dutch town of Limmen. Today, we can still fall under the spell of these majestic tulips, because few other tulip cultivars display such bold flames of colour without indication of virus. 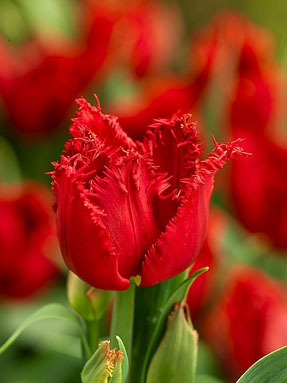 Single early tulips have sturdy flowers with a very distinct shape. They are constructed of six petals that are usually pointed at the tip. 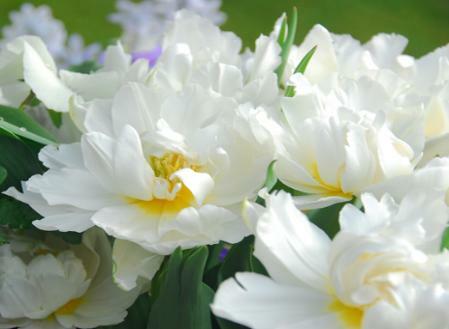 These tulips are very suited to flower containers, beds and borders. Quite a few cultivars (marked here with an asterisk) are just perfect for forcing into flower indoors. This group includes what used to be known as the Darwin, Breeder and Cottage tulip groups. These outdated names, however, should no longer be used. 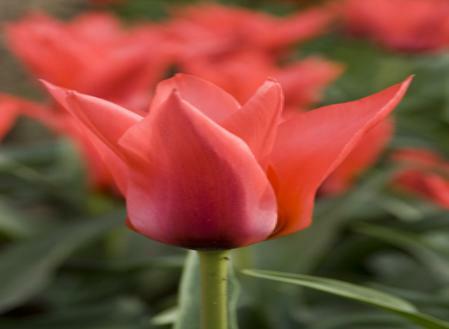 By combining these previous groups, the current Single late tulip group was formed. This group contains a wide variety of flower shapes, although Viridiflora tulips and Fringed (or Crispa) tulips have now been removed from this group. The Single late tulips and the Darwin hybrids deserve the title for being the tallest tulips in the entire assortment. 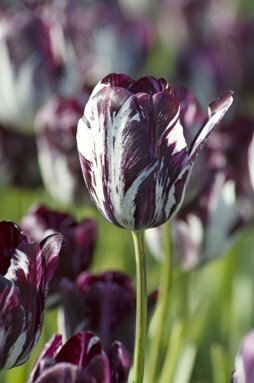 Single late tulips can be found in almost any colour known to tulips, including some extremely unusual bicoloured varieties. Single late tulips make first-class cut flowers. At this time, Viridiflora tulips form the least significant group. Many gardeners looking for unusual plants, however, quickly find what they want in the way of tulips in this group. The tulips in this group are closely related to Single late tulips and have also inherited several of their other characteristics. The flower shape is like that of the Lily-flowered tulips. What makes these tulips so fascinating is that their petal colour includes green. Another of Viridiflora's assets is that its flowers remain beautiful a long time - a good three weeks. They work well as cut flowers.